The inspiration for the name FIDENTIST stems from the Latin word fidens. Fidens means “confident” and “without fear”. Our vision for how we want to practice dental care is all about giving the patient confidence and making sure it’s a safe and pleasant experience. It’s all about the patient at FIDENTIST. With a team of top notch professionals who are passionate about their work and people, our goal is to offer the best dental care for everyone. 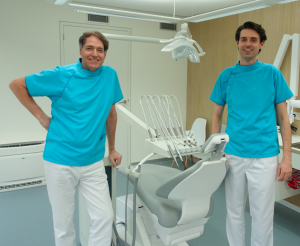 With over 37 years of experience as a dentist, Michiel couldn’t wait to open a practice together with his son who decided to follow in his footsteps. They’ve accumulated their passion for dentistry and proudly opened the practice in November 2017. We can’t wait to welcome you in our practice! We offer the best dental care for everyone. From regular check-ups to full mouth rehabilitation, our goal is to put a healthy smile on your face. Your wishes and concerns are important to us. Our team of dental professionals is dedicated to ensuring you have a satisfactory experience and your needs are met. We take our time to walk you through your treatment plan and the expected costs. We pride ourselves in making sure every patient is well-informed. Want to stay up to date about our progress towards the opening of the new dental practice? Sign up for our newsletter now! Looking to work in a dynamic team in a brand new dental practice with room to grow? Leave your details and we’ll get back to you as soon as possible.